I started dogsledding in 2003 when I adopted a Siberian Husky and had no idea what I was in for. Reo was eating my house. After doing some research on husky behavior, I learned they are an energetic dog that needs to run. I met a couple of other husky owners and we started skateboarding with our dogs and eventually acquired dogsledding equipment. People saw us riding around Greene Valley Forest Preserve and wanted to join in on the fun. Not long after that I realized I had to actually learn how to mush dogs, so I attended training classes and seminars in the northern states (since we didn’t have any active dog mushers in this area). 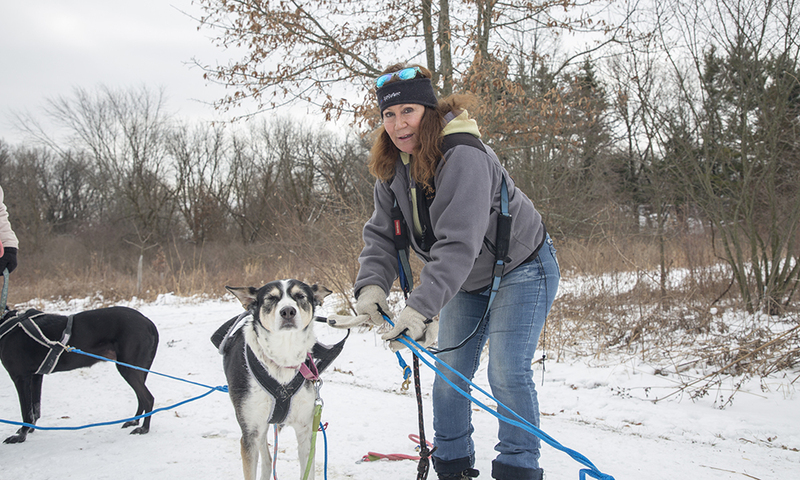 McNeely, of Lemont, hooks up Elaine to the dogsled team before a ride at Greene Valley Forest Preserve. I handled dogs for a kennel racing in the Iditarod twice. 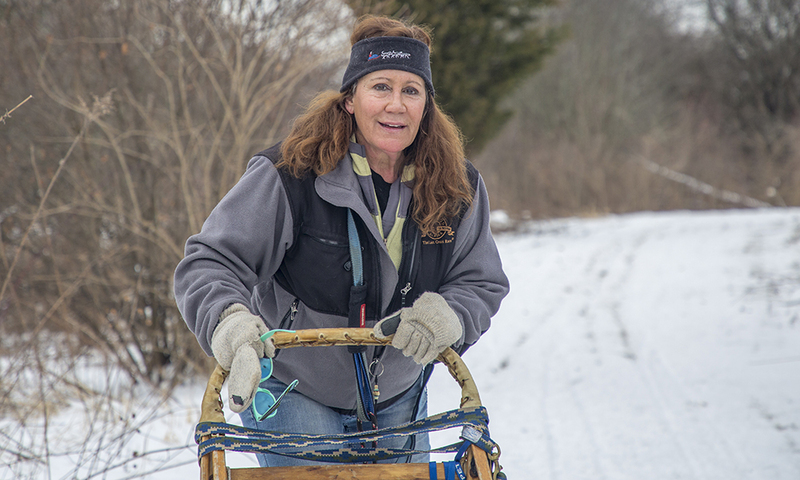 I started racing myself and eventually, when my huskies passed on, I rescued dogs from sledding kennels. Alaskan Huskies are faster than Siberian Huskies. They are not as furry, but the mix of husky, Pointer and greyhound creates a superb racing dog. I’ve always believed in rescue dogs; they make terrific pets and sled dogs. Most dogs like to run in a team or participate in the other dog sports. You can’t force a dog to dog sled. Along with other seasoned club members, we get people started on training their dogs so they can join in on a team in the future. 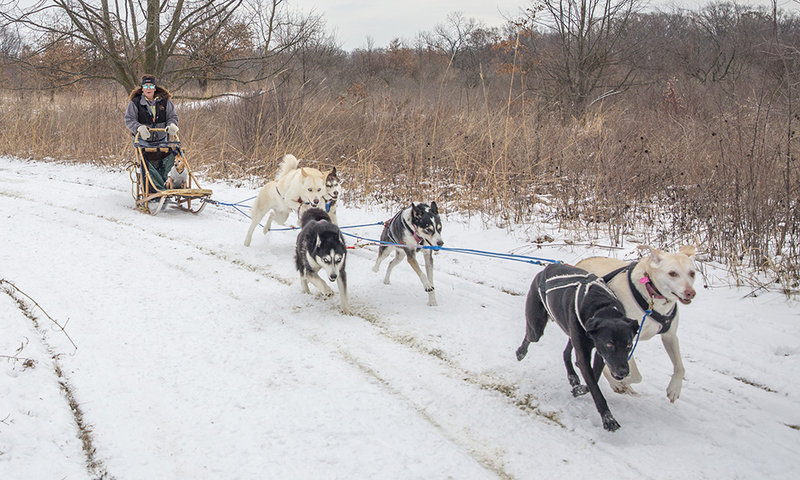 To create a good sled dog, training must continue at home. We have a core group that mushes almost every week when the weather is cold enough. Training days are posted on our Facebook page, Green Valley Dog Drivers. 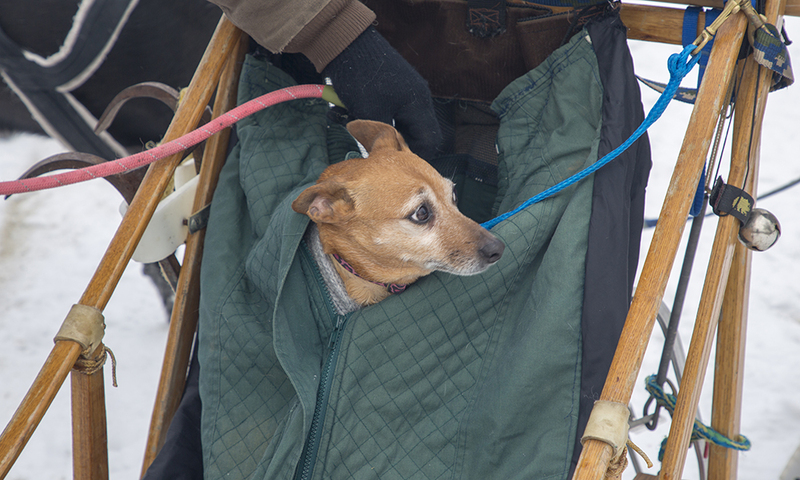 Maizie gets tucked in and secured on the sled before the ride. Members come as they please, but it is very addictive. Anyone coming out with us should plan to help handle dogs and start learning to drive their own dogs. It’s great exercise and a lot of fun. I want to pass on the thrill of the sport, which you can only experience by stepping into a musher’s boots. We bring our experiences to schools and park districts through demonstrations and seminars. All of our dogs are friendly and love kids. Of all the sports in the world, this is the one you share with your best friend. It’s a myth that snow is needed to run dogs. We also use bikes, scooters and 3-wheeled carts. But the sled is different. The only sounds are the runners gliding through the snow and the dogs breathing. McNeely drives the dogsledding team of Carol and Sally in the lead, Zelda and Elaine in the swing (middle), Zeke and Zoe in the wheel position (rear), and Maizie on the sled. I was born with the nature bug. I rode my bike with stuffed animals in the basket to the fort my friend and I built on a wooded lot. I never stepped on ants (LOL) and always knew to be respectful of nature. My parents never went camping or hiking, so go figure! I was always the kid who loved to spend all my time in the woods and picked up any outdoor sport. My kids and I spent their youth in the DuPage forests. We happen to live next to one! Snow is my favorite time of year. Eventually I became a ranger with the Forest Preserve District of DuPage County. I retired 4 years ago. 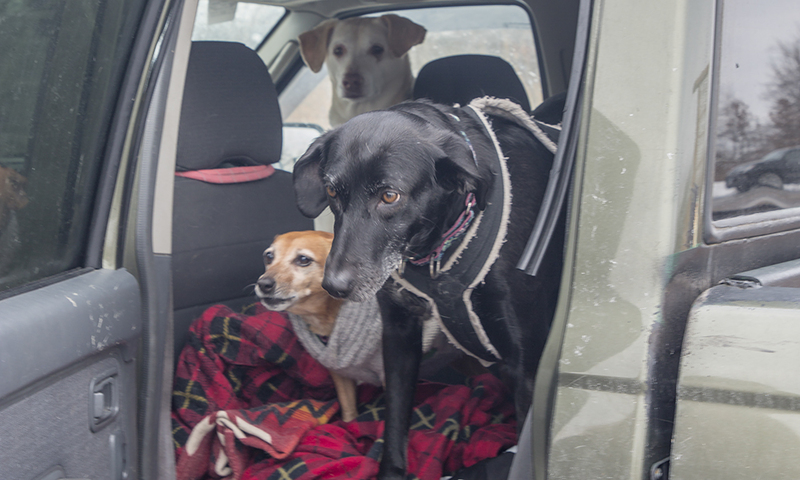 Maizie (lower left), Carol and Sally (rear) are eager to get started after arriving at Greene Valley Forest Preserve with McNeely. My granddaughter is 6 and enjoys hiking and discovering nature. Because of my career as a ranger I can teacher her so much — from the moss on a log to the red-tailed hawk flying above. We camp in the backyard all summer long. Sometimes when I look at the beauty or see a deer or coyote I get this weird feeling. I think it’s love. As a ranger, I’ve seen how important education is to kids. It was amazing to see how many kids hadn’t seen a raccoon or didn’t know how detrimental littering is to nature. Some adults think all animals have diseases and don’t want them in their yards. People need to understand nature to find inspiration in it. Not everyone is lucky enough to grow up next to a wooded lot like I did, but you can explore nature in the DuPage forest preserves. The exposure will inspire. 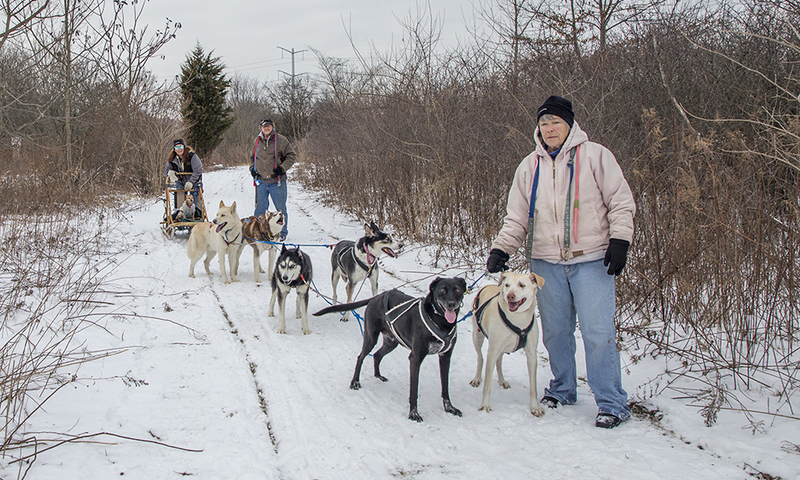 McNeely and Mike and Deb Rawaillot, of Woodridge, help with the team: Maizie (on the sled), Zeke and Zoe on the wheel (rear), Zelda and Elaine on the swing (middle), and Carol and Sally in the lead. 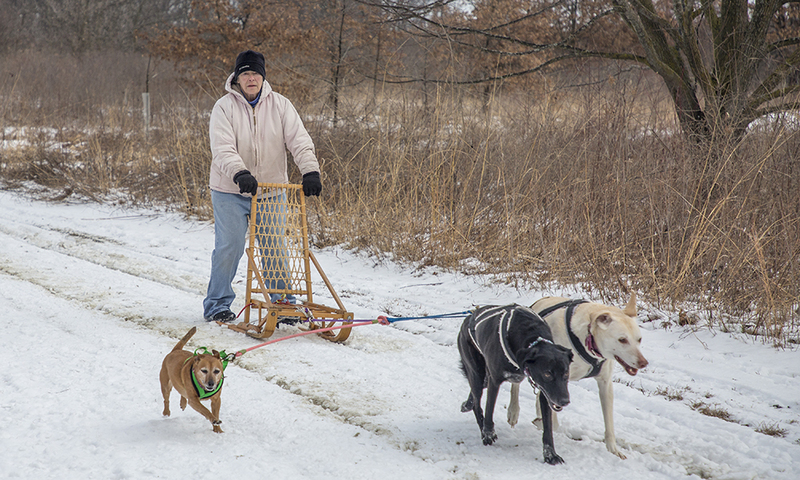 Deb Rawaillot drives the sled with Maizie, Carol and Sally (left to right). In her younger years, Maizie, a Chiweenie rescue, was able to pull 867 pounds on a sled.